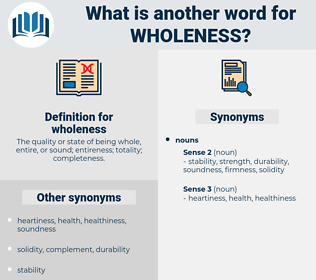 What is another word for wholeness? 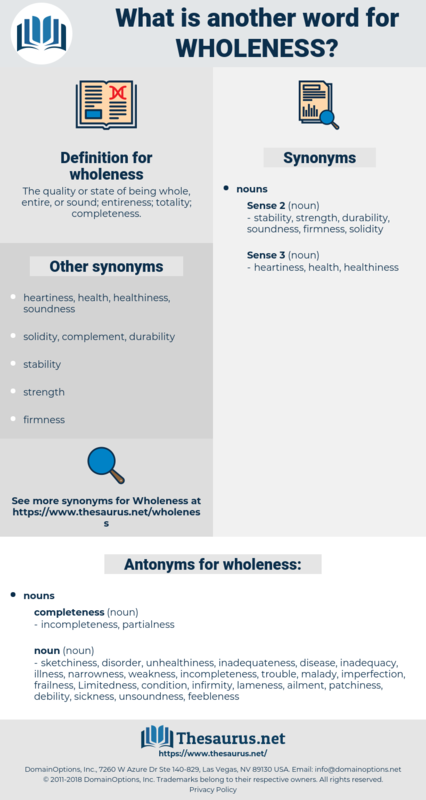 The quality or state of being whole, entire, or sound; entireness; totality; completeness. unsoundness, feebleness, Limitedness, condition, decrepitude, imperfectness, weakness, unhealthiness, malady, lameness, illness, sickness, disorder, ailment, inadequacy, patchiness, trouble, disease, infirmity, inadequateness, narrowness, debility, sketchiness, imperfection, frailness. What it then produces may indeed be picturesque, melodramatic, sensual, but it will not be beautiful because there will be no imaginative wholeness in it. Our broken school days lose us clues, Some lesson has been missed, the final meaning And wholeness of the grammar are disturbed - That shall not be made up in all our life.